I recently had the pleasure of volunteering at Milwaukee’s PrideFest, an annual lesbian, gay, bisexual, and transgender (LGBT) pride celebration. The most surprising aspect of the night wasn’t the outrageous, Project Runway-inspired attire, but the fact that ALL 3 of the people I volunteered with were straight. Perhaps my surprise was unwarranted. Indeed, not a single straight friend that I invited to the event questioned the invitation. However, there is something truly inspiring and compassionate in supporting causes that directly benefit others rather than yourself. Straight ally support is not only welcome, but it is a crucial, potentially life-saving mechanism in the lives of teenage LGBT individuals. Recent celebrity deaths have refocused media attention on suicide and mental health. A topic often left unaddressed is the heightened suicide risk of LGBT youths, who are almost five times as likely to attempt suicide as their straight peers. Recent research shows that simply having a Gay Straight Alliance in high schools cuts the rate of homophobic discrimination and suicidal thoughts of LGBT youths by more than half. In celebration of this year’s pride month, I extend my utmost appreciation to the brave LGBT and straight heroes who have pushed for LGBT civil rights and acceptance. However, much more remains to be done. Have you done your part to support your LGBT friends, family members, and coworkers who may be silently struggling with acceptance or depression? 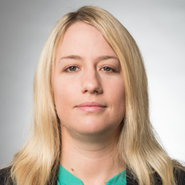 Averi Niemuth is an Associate in the Commercial Litigation group in the Milwaukee office.